Succulent, juicy chicken can be difficult to achieve. Don’t cook the meat enough and it could be harmful to your health, cook it too much and it is dry and rubbery. As a staple meal for many Australian families, roast chicken is an important dish to perfect. The following are just a few tips to help you create the perfect roast chicken. One of the most vital steps is to make sure you get a good quality chicken. Find a good butcher who can get you a whole raw chicken. They can even help with how to best cook the meat, as well as offering other tips and tricks. When thawing your chicken, place it in the fridge the night before. Never thaw it on the sink or benchtop as this can contaminate it. Keep the chicken in a large dish and once thawed, cook it within 24 hours. Once you have prepared the chicken to your liking, lay it breast side down in a dish with a strainer, turning it halfway through cooking to evenly distribute its juices. Cook the chicken on a high heat, around 200 degrees Celsius, to brown the skin deeply and keep it nice and crisp. The worst thing you can do is overcook the chicken, as this will leave it dry and chewy. In order to prevent this, invest in a meat thermometer and insert it into the thickest part of the thigh at intervals throughout the cooking process. It should read somewhere between 70 and 80 degrees Celsius. It can be tempting to start cutting the chicken as soon as it’s cooked, but like all meat, you need to give it time. Resting for at least 15 minutes allows the juices to settle. This will also aid in keeping the meat moist and tender. For more advice or for high quality whole chickens, head to online butcher, Meatcart, today. Posted in All about meat	and tagged with chicken breasts online, buy chicken online, roasting the perfect chicken, Brisbane Butcher, Online Butcher	. This is the most important part of the process. What cut you choose is dependent on personal preference, so the first thing to do is figure out how you like your meat. Looking for something lean? Go for tenderloin. Prefer meat that is juicy and tender? Go for ribeye. Your butcher should be able to help you find the perfect cut. Whether you are taking it from the freezer or fridge, you should let the meat sit to allow it to come to room temperature. For steaks from the refrigerator, about half an hour should be enough. Cover it with a sheet to avoid any contamination. When seasoning your steak, try to keep it simple. Get some quality rock salt and season generously. With a good cut, you shouldn’t need to add much – let the steak speak for itself! If you have a griller, this is ideal, but for those who don’t, make sure you have a good pan. Something with a thick bottom, preferably made of cast iron, is suitable. Non-stick pans are not recommended as they can prevent a good crust from forming on the steak. Once you have cooked the meat to your preferences, allow it to rest for a few minutes before serving. For a 200g steak, 5 minutes is enough. This allows the juices that have been drawn to the surface to relax and absorb back into the meat. For more advice on cooking the perfect steak or to order some all Australian steaks, head to online butcher Meatcart’s beef section today. Posted in All about meat	and tagged with cooking steak, how to cook steak, Brisbane Butcher, Online Butcher	. Planning an impromptu bbq with the neighbours but can’t find time during the week to go shopping for meat? Maybe the plan is for a get together on the weekend with little time to organise, let alone time to get out to the shops for all ingredients. Maybe you plan to shop for a particular type of meat such as steak, veal or lamb and want to check out some range before you decide what will be the start of the show. With the small amount of time to organise this can add to the already large amount of stress. The answer is simple. They need to find online butchers so that they can purchase the rump steak over the Internet whilst they are in the office. This will avoid them having to be away from their desks for any length of time. It has to be said that buying online meat is becoming increasingly popular for this very reason. You can have it delivered to your home so that you don’t even need to go into the shop to pick it up. So, what is the process for ordering meat online and how easy is it? It couldn’t be simpler; jump online to www.meatcart.com.au who have the reputation for being the leading online butcher in Brisbane. Simply browse our range on our easily navigable website and pick out what products you wish to order. It easy as registering online and placing an order! Once paid for, the meat will be delivered within two business days after the order is placed. If you’re still undecided on what meat to purchase for your bbq, check out our vast range online or have a read of our blog to get some fresh ideas for fantastic meals! Posted in All about meat	and tagged with Butcher Online, Brisbane Butcher, Online Butchers, Order Meat Online, Buy Meat Online	. Most people know their sirloin to their silverside, but have you ever heard of the flank or flat-iron? When it comes to buying beef, if you know your cuts, then you can decide what you need depending on what you are cooking. One of the easiest ways to find out which cut would suit you best is to remember that the cow is divided up into sections. The two forequarters are generally better for stewing or braising as they tend to be slightly tougher. The two hindquarters are more tender and produce cuts that are often used for roasting, frying or griddling. The most well-known cuts of beef are steaks, such as rib-eye, sirloin, fillet, T-bone, rump and flank. Rib-eye can be quite fatty which helps keep it nice and moist. Taken from the eye of the fore rib, they are great pieces to chargrill. The top sirloin has just about the right amount of marbling of fat to give the cut a lovely flavour and is quite often served by itself with chips and seasoning. The fillet is a premium cut, as it is the leanest and most tender steak, whilst the T-bone is a combination of the fillet and sirloin. The flank is taken from underneath the cow and is a naturally lean piece of meat, whilst the rump is firmer than the fillet and widely believed to have more flavour. The most popular roasting cuts tend to be the topside or silverside, which are taken from the hindquarter. Silverside is often used to make salt beef or corned beef, as it can be slightly tougher then topside. There are several cuts which are relatively unknown to most meat eaters but are quickly gaining popularity due to their lower price tag. The flat iron steak – also known as the oyster blade steak – is taken from the shoulder and can be slightly tougher than other cuts as it is not cross-grain. The hanger steak is again, a relatively cheaper piece of beef and is extremely flavoursome. Taken from the cow’s diaphragm, it has started to become popular in restaurants. The shin, brisket and the chuck and blade are ideal for stewing or slow cooking recipes. The shin can be bought with the bone in or out and normally comes in medallions and the brisket is cut from the belly of the cow. When stewed for a long period of time the meat becomes very tender and is known for its succulence. Combined with its low price, it has become a very popular choice. The chuck and blade, also sometimes called the shoulder, is made up of chuck steak and blade steak. Whatever you are looking for, you can find it all at Meatcart. The online butchers combines old fashioned services with modern online ordering to make buying great meat easier than ever before, so check it out today! Posted in All about meat	and tagged with buy beef online, cuts of beef, beef cheat sheet, Brisbane Butcher, Buy Meat Online, Online Butcher	. Before the Internet was invented, buying meat would usually involve having to pop into the local butcher’s shop or approach the butcher’s counter in the local supermarket. A truly convenient butcher would offer a service whereby they would take the customer’s order over the phone and then deliver the meat in a refrigerated van, but this was a very rare occurrence. When the Internet arrived on the scene this all changed as many e-commerce sites were set up selling a whole range of products. Some of these sites were butchers selling online meat to the public. With everything going on in our busy lives we set aside little time to shop for a weeks’ worth of groceries, especially when it comes to meat products which usually requires enormous planning to work out what is required for each day. Nowadays, it is so easy to go online and order everything over the Internet from the comfort of your home at any time of the day or night, saving time and money! When it comes to online stores, a reputation doesn’t just have to be upheld, it has to be built. This means that at all times the quality of meat provided has to be superior to any common in store butcher. For those that are new to shopping online, troublesome websites that are hard to navigate can be infuriating, often causing the customer to not return. Customer satisfaction is imperative when shopping online. A successful online butcher should have a website that is not only easy to navigate, but also provide a simple process for purchasing the goods as well as a secure payment system so the customer has no fear of shopping online. When meat is ordered it needs to be dispatched as quickly as possible; there is no point placing an order on a butcher’s website that will take a week to arrive. The customer should receive the meat in two to three days to ensure satisfaction. A quality butcher will always use a temperature controlled delivery van which is registered with Safe Food Queensland and delivered by trained delivery staff. The meat should be dispatched in cold containers that can be left outside the customer’s home for a number of hours without the meat going off. Meatcart not only matches all of these principle factors but excels in each of them. To see even more reasons why Meatcart is the leader in online butchers, jump online today at www.meatcart.com.au. Posted in All about meat	and tagged with Order Meat Online, Buy Meat Online, Online Meat, Online Butcher	. When buying any product online it is vital that the service that the company provides is of the highest quality and, needless to say, that the product that you are buying is fit for purpose. This is particularly important when it comes to ordering meat over the Internet using online butchers. After all, this is fresh produce that can quickly go off; it is even more important from a health and food hygiene point of view that the butchers that you are ordering from sells and delivers meat products of the highest standard, as well as has stringent systems in place to ensure the meat is kept fresh until it is received. The butchers need to provide meat that is extremely fresh and, having been ordered online, it needs to be delivered in a van that is refrigerated. It also needs to be packed in a suitable container that will keep it fresh for several hours once it is delivered to the house in the instance the customer is at work. Having ordered your meat you want it delivered as quickly as possible and need to know that if the butchers you have purchased from are reliable in their estimated delivery times. The customer may have a barbecue or party planned for three days hence and cannot afford to be let down due to a late delivery. If you live in the Brisbane area, you will be pleased to hear that provide an online butchers service to their many customers. They have an enviable reputation for the quality of their meat and the standard of service that they provide to both customers that visit their shop but also to those shopping online. Posted in All about meat	and tagged with Expectations of an Online Butcher, Meatcart, Online Butcher	. For many Australian households, meat is a common ingredient in lots of family dinners and work lunches. Whether it’s a roast lamb on Sunday afternoon, some steak and barbecue sauce on a sandwich, fish and chips on Friday or a handful of steamed chicken thrown into your salad, meat is a part of our every day. Meatcart is an online meat supplier who combines old fashioned service with modern technology. They deliver to your door, so you can order from the comfort of your desk and still get the quality and service of your local butcher. They offer beef, pork, lamb, chicken and seafood in varying sizes and prices, so there is something for every meal you want to cook up! With meat being such an integral part of our lives, it’s no wonder we use it in almost every meal. But just how much do we eat? The following infographic looks at the amount of meat Australians consume on average, what type of meat we prefer, the top five dinner meals and much more. 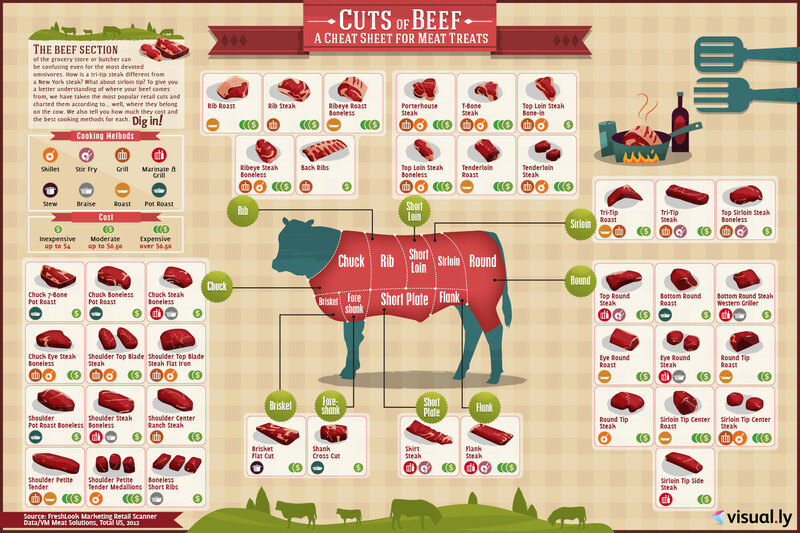 Posted in All about meat	and tagged with meat consumption, how much meat do we eat, Meatcart, Online Butcher	. Most families lead very busy lives both socially and professionally with little spare time available to do many of the more mundane tasks around the home such as cooking delicious meals, doing gardening and spending time with the kids. So, when a family plan to host a dinner party there is a lot of preparatory work to do. For instance, all the food needs to be purchased and this tends to be arranged in one of two ways. Either they pop down to the local shops or supermarket or, to save time, shop online. Shopping online is becoming more popular as it can be ordered at any time of the day or night to fit in with the customer’s busy schedule. If someone is ordering the likes of vegetables, desserts and bread online they might as well order their meat online at the same time. When it comes to ordering meat there are a number of online butchers to choose from but it is preferable that one is selected that will arrange to deliver the meat to the home rather than ask the customer to call into the shop to collect it. Alternatively, it would be nice to have the option for the butcher to deliver the meat to the customer’s office if they are not going to get home until very late. When selecting a butcher to home deliver meat it is vital that the meat is delivered in a refrigerated van and that the meat is contained in suitable containers that will keep the meat cool for several hours if it has to be left outside the customer’s front door if they are out at work all day. This will ensure the meat’s freshness. Meatcart will arrange home delivery of a variety of cuts of meat that are needed for the dinner party and they are renowned as being the best butcher in Brisbane. Posted in All about meat	and tagged with online butchers brisbane, online butcher brisbane, organic meat delivery, organic meat delivery brisbane	. It’s hard enough picking a lovely juicy steak at the shops let alone online. In store the meat can be seen and it is even possible to smell its aroma, or ask the butcher face to face what the quality is like. When buying online a customer has to rely entirely on the image representing a particular cut of meat. With a less reputable butcher there is always a risk that what you receive will not necessarily look like the meat you ordered. If the butcher is local the customer can always pick up the phone and ask about the quality of the meat. However, it is possible to judge the quality based on the guidelines of the Meat Standards Australia (MSA). Red meat is graded by the MSA based upon a variety of factors including juiciness, flavour, tenderness and overall liking of the cut of steak. One of the most powerful ways of finding out about the online butchers reputation for quality steaks is to look for any testimonials on the Internet. It is always good to read a variety of reviews to provide a broad overview. If the butcher’s shop is local to where the customer lives they could also get the opinions of people that frequent the shop. If a butcher has a poor reputation for the quality of his or her meat, word will quickly get around and the public will start to use other suppliers. Over a period of time they could try a number of different online butchers and they will quickly find out which ones provide them with the quality of service and meat that suits them. Everyone always wants the best price, but they always want to ensure they get quality for their dollar. A great approach when it comes to buying meat online is to research different butchers who have consistently moderate prices. By avoiding the cheapest as well as the most expensive will ensure a low cost cut while still retaining high quality. Not only does Meatcart offer the highest quality cuts of meat at very affordable prices, the expert team at Meatcart pride themselves on exceptional customer service and satisfaction. Jump online to check out our range, or check out our blog to see why Meatcart is renowned as the leading online butcher. Posted in All about meat	and tagged with bulk meat brisbane, organic beef online, organic meat delivery brisbane, organic meat online	. Organic products are no longer only for the wealthy or those who produce the goods themselves. These days, organic products, including organic beef, are easily accessible to the general public, allowing consumers to not only enjoy high quality meat, but also contribute to a sustainable and environmentally friendly future. Across the world, organic butchers offer high quality cuts of meat that have been made in a sustainable and eco-friendly process. In Brisbane, there are a significant number of butchers now supplying organic meat at an affordable rate. One company leading the way is online butcher, Meatcart. Meatcart is an organic butcher offering a wide variety of products from beef and pork to chicken and seafood. Unlike other butchers, they sell their products in a unique way – online. Offering old fashioned service with a modern twist, their meat is some of the best in the country, coming in a variety of styles and sizes at reasonable prices. Their products are all 100 per cent Australian, so you can support local produce and good practices from the comfort of your home. If you are one of the many individuals turning to organic products and are looking for an organic butcher in Brisbane, consider Meatcart. Whether you need diced beef, mince or a steak for the barbie, they have great products at great prices, sent straight to your door! These days, there are hundreds of organic butchers across the country. It is important you find one offering quality products, reasonable rates and good practices. For more information on organic beef, or to order any of Meatcart’s products, visit the organic butcher online or call 1800 6328 2278 and see for yourself why Meatcart are different from the rest. Posted in All about meat	and tagged with Butcher Sunshine Coast, Butcher Gold Coast, Butcher Brisbane, Online Butcher	.